You know phones? Those functional communication and content-deliver devices that we carry around in our wallets and purses and use our mouths to speak into and fingers to poke at? You know what they need? A fragrance chip. To smell pretty. Apparently. 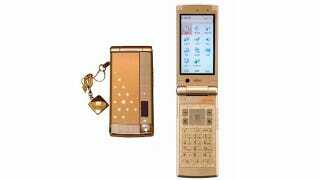 The Fujitsu F-022 nightmare you see before you is a shiny, sparkly, stinky mess, a flipper with "detachable fragrance chip" on which you can spray the scent of your choice. Which, honestly, I can't think of an appropriate odor other than "bizarre desperation."